Soon afterwards the German government announced an unrestricted warfare campaign. This meant that any ship taking goods to Allied countries was in danger of being attacked. This broke international agreements that stated commanders who suspected that a non-military vessel was carrying war materials, had to stop and search it, rather than do anything that would endanger the lives of the occupants. The Lusitania, was at 32,000 tons, the largest passenger vessel on transatlantic service, left New York harbour for Liverpool on 1st May, 1915. It was 750ft long, weighed 32,500 tons and was capable of 26 knots. On this journey the ship carried 1,257 passengers and 650 crew. William McMillan Adams was travelling with his father. "I was in the lounge on A Deck when suddenly the ship shook from stem to stem, and immediately started to list to starboard. I rushed out into the companionway. While standing there, a second, and much greater explosion occurred. At first I thought the mast had fallen down. This was followed by the falling on the deck of the water spout that had been made by the impact of the torpedo with the ship. My father came up and took me by the arm. We went to the port side and started to help in the launching of the lifeboats." The sinking of the Lusitania had a profound impact on public opinion in the United States. The German government apologized for the incident, but claimed its U-boat only fired one torpedo and the second explosion was a result of a secret cargo of heavy munitions on the ship. If this was true, Britain was guilty of breaking the rules of warfare by using a civilian ship to carry ammunition. British authorities rejected this charge and claimed that the second explosion was caused by coal dust igniting in the ship's almost empty bunkers. Some newspapers in the United States called on President Woodrow Wilson to declare war on Germany. However, he refused to do this as he wanted "to preserve the world's respect by abstaining from any course of action likely to awaken the hostility of either side in the war, and so to keep the United States free to undertake the part of peacemaker". (9) However, when it became clear that he intended to keep out of the First World War for economic reasons. 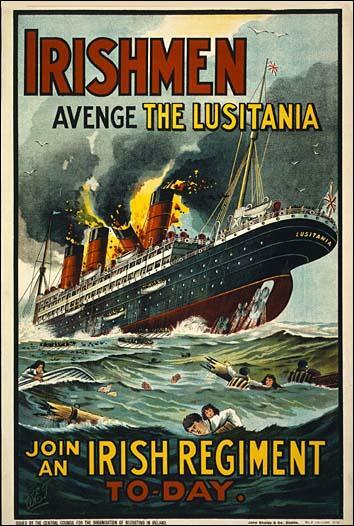 (10) The British government decided to use the sinking of the Lusitania to recruit men into the armed forces and published several posters in 1915. The waters round Great Britain and Ireland, including the English Channel, are hereby proclaimed a war region. On and after February 18th every enemy merchant vessel found in this region will be destroyed, without its always being possible to warn the crews or passengers of the dangers threatening. Neutral ships will also incur danger in the war region, where, in view of the misuse of neutral flags ordered by the British Government, and incidents inevitable in sea warfare, attacks intended for hostile ships may affect neutral ships also. (2) Statement issued by the German Embassy on 22nd April 1915. Travellers intending to embark for an Atlantic voyage are reminded that a state of war exists between Germany and her allies and Great Britain and her allies; that the zone of war includes the waters adjacent to the British Isles; that in accordance with the formal notice given by the Imperial German Government, vessels flying the flag of Great Britain or any of her allies are liable to destruction in those waters; and that travellers sailing in the war zone in ships of Great Britain or her allies do so at their own risk. In New York, during the weeks preceding the last voyage of the Lusitania, there was much gossip of submarines. It was freely stated and generally believed that a special effort was to be made to sink the great Cunarder so as to inspire the world with terror. She was at that time the largest passenger boat afloat. The few pre-war passenger boats of greater tonnage had been commandeered for war service of various kinds. On Saturday, May 1st (the day on which the Lusitania was to sail), in order that there might be no mistake as to German intentions, the German Embassy at Washington issued a warning to passengers couched in general terms, which was printed in the New York morning papers directly under the notice of the sailing of the Lusitania. The first-class passengers, who were not due on board till about ten o'clock, had still time after reading the warning, unmistakable in form and position, to cancel their passage if they chose. For the third-class passengers it came too late. As a matter of fact, I believe that no British and scarcely any American passengers acted on the warning, but we were most of us very fully conscious of the risk we were running. A number of people wrote farewell letters to their home folk and posted them in New York to follow on another vessel. (4) William McMillan Adams was an American passenger aboard the Lusitania when it was torpedoed on 7th May 1915. I was in the lounge on A Deck when suddenly the ship shook from stem to stem, and immediately started to list to starboard. I rushed out into the companionway. While standing there, a second, and much greater explosion occurred. At first I thought the mast had fallen down. This was followed by the falling on the deck of the water spout that had been made by the impact of the torpedo with the ship. My father came up and took me by the arm. We went to the port side and started to help in the launching of the lifeboats. Owing to the list of the ship, the lifeboats had a tendency to swing inwards across the deck and before they could be launched, it was necessary to push them over the side of the ship. While working there, the staff Captain told us that the boat was not going to sink, and ordered the lifeboats not to be lowered. He also asked the gentlemen to help in clearing the passengers from the boat deck (A Deck). it was impossible to lower the lifeboats safely at the speed at which the Lusitania was still going. I saw only two boats launched from this side. The first boat to be launched, for the most part full of women, fell sixty or seventy feet into the water, all the occupants being drowned. This was owing to the fact that the crew could not work the davits and falls properly, so let them slip out of their hands, and sent the lifeboats to destruction. I said to my father "We shall have to swim for it. We had better go below and get our lifebelts. When we got down to Deck D, our cabin deck, we found it was impossible to leave the stairs, as the water was pouring in at all the port holes. Finally, we reached the boat deck again, this time on the starboard side, and after filling a lifeboat with women and children, we jumped into it. The lifeboat was successfully lowered until we were about twelve feet from the water, when the man at the bow davit lost his nerve, and let the rope go. Most of the occupants were thrown into the water, but we, being in the stern, managed to stay in. The lifeboat was full of water, but the sailors said it would float if only we could get it away from the Lusitania which was now not far from sinking. My father threw off his overcoat, and worked like a slave trying to help loose the falls from the boat. This, however, was impossible. B. Deck was then level with the water, and I suggested to my father we should climb up and get into another lifeboat. He, however, looked up, saw the Lusitania was very near its end, and was likely to come over on us, and pin us beneath. He shouted to me to jump, which I did. We were both swimming together in the water, a few yards from the ship, when something separated us. That was the last I saw of him. After about an hour I was helped on to a collapsible boat which was upside down. It was at this time that we saw smoke coming towards us on the horizon out to sea, but as soon as the funnel was just in sight, it went away again from us. This must have been one of the boats that the German submarine stopped from coming to our rescue. It became impossible to lower any more from our side owing to the list on the ship. No one else except that white-faced stream seemed to lose control. A number of people were moving about the deck, gently and vaguely. They reminded one of a swarm of bees who do not know where the queen has gone. I unhooked my skirt so that it should come straight off and not impede me in the water. The list on the ship soon got worse again, and, indeed, became very bad. Presently the doctor said he thought we had better jump into the sea. I followed him, feeling frightened at the idea of jumping so far (it was, I believe, some sixty feet normally from "A" deck to the sea), and telling myself how ridiculous I was to have physical fear of the jump when we stood in such grave danger as we did. I think others must have had the same fear, for a little crowd stood hesitating on the brink and kept me back. And then, suddenly, I saw that the water had come over on to the deck. We were not, as I had thought, sixty feet above the sea; we were already under the sea. I saw the water green just about up to my knees. I do not remember its coming up further; that must all have happened in a second. The ship sank and I was sucked right down with her. The next thing I can remember was being deep down under the water. It was very dark, nearly black. I fought to come up. I was terrified of being caught on some part of the ship and kept down. That was the worst moment of terror, the only moment of acute terror, that I knew. My wrist did catch on a rope. I was scarcely aware of it at the time, but I have the mark on me to this day. At first I swallowed a lot of water; then I remembered that I had read that one should not swallow water, so I shut my mouth. Something bothered me in my right hand and prevented me striking out with it; I discovered that it was the lifebelt I had been holding for my father. As I reached the surface I grasped a little bit of board, quite thin, a few inches wide and perhaps two or three feet long. I thought this was keeping me afloat. I was wrong. My most excellent lifebelt was doing that. But everything that happened after I had been submerged was a little misty and vague; I was slightly stupefied from then on. When I came to the surface I found that I formed part of a large, round, floating island composed of people and debris of all sorts, lying so close together that at first there was not very much water noticeable in between. People, boats, hencoops, chairs, rafts, boards and goodness knows what besides, all floating cheek by jowl. A man with a white face and yellow moustache came and held on to the other end of my board. I did not quite like it, for I felt it was not large enough for two, but I did not feel justified in objecting. Every now and again he would try and move round towards my end of the board. This frightened me; I scarcely knew why at the time (I was probably quite right to be frightened; it is likely enough that he wanted to hold on to me). I summoned up my strength - to speak was an effort - and told him to go back to his own end, so that we might keep the board properly balanced. He said nothing and just meekly went back. After a while I noticed that he had disappeared. For our and other peoples' protection we must gain the freedom of the seas, not as England did, to rule over them, but that they should serve equally all peoples. We will be and will remain the shield of peace and freedom of big and small nations. In Germany and Austria the people are undisguisedly delighted. They see in the sinking of the liner a fulfilment of all their boasts about the submarine blockade, which has hitherto signally failed to win any military or naval advantage. 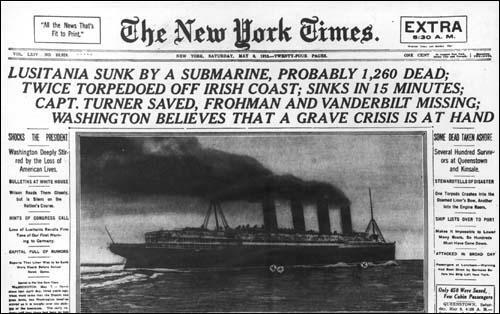 The newspapers seek to find an excuse in the Lusitania's armament. Their charge is false. Both the Admiralty and the Cunard company declare positively that the ship carried no guns. She had never done so, and the Government, although they had the right to employ her, had never called for her services. She was a genuine non-combatant merchant vessel. The Lusitania was 790 feet long, 88 feet broad, and her gross tonnage was 32,500. There was, of course, one way in which she might be made available for Admiralty service. Though she was built as a swift passenger-ship, and a very large proportion of her space was occupied by engines and cabins, and her actual capacity was small in comparison to her tonnage, still she could carry a good deal, and her speed, 26.6 knots at her best, would enable her to escape the pursuit of most cruisers. These qualities would make her valuable as a carrier of ammunition. When the war broke out the Admiralty did not call on the company to hand the Lusitania over to them for service. She continued to be employed as a passenger-ship. The German Government has maintained, and continued to maintain, that the British Admiralty was guilty of what would have been a singularly mean device. It alleged, and went on alleging, that though the Lusitania continued to run as a passenger-ship she was loaded with contraband in the form of explosives, that the travellers who crossed the Atlantic in her were simply a blind, and that they were, in fact, allowed to embark in ignorance of the danger they were running, and in the hope that their presence would save the ship from attack. 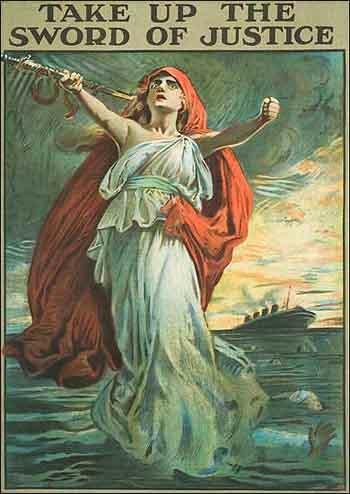 The Germans quoted the undoubted fact that the Lusitania was warned at an earlier stage of the war to hoist the American flag when approaching the coast of Ireland as a proof that she was really in the service of the Admiralty. This assertion was firmly denied both at home and in America, and it was impossible to believe that the German Government possessed evidence of the truth of its charge. If it had, it possessed an easy means of both stopping the Lusitania and discrediting the British Admiralty. The laws of the United States forbid the carrying of large quantities of explosives in passenger ships. Had the German Government held even prima facie evidence that explosives were being smuggled on board contrary to the United States law it would have taken the correct legal steps to call the offenders to account. It had every reason for taking this course, since a demonstration that the British Admiralty was making a gross and most insulting abuse of the hospitality of the port of New York must have produced an impression highly favour- able to Germany on public opinion in America. There can be but one explanation of the failure of the German Embassy at Washington to avail itself of so effective a weapon; and it is, of course, that there was no proof of the alleged violation of neutrality and American Law. The fact is that the ship sank in 18 minutes. That could only happen as the result of a massive second explosion. We know there was such an explosion, and the only thing capable of doing that is ammunitions. It's virtually impossible to get coal dust and damp air in the right mixture to explode, and none of the crew who were working in the boiler rooms and survived say anything about a boiler exploding. I don't think there's any question that there was a steamline explosion, but that wouldn't have damaged the ship to the point where it sunk in 18 minutes. It's blarney, part of another cover story.